This tool is excellent ! But I have a problem : the website I am using as test is in french, and so I chose french Search Engines to calculate the KEI of my keywords, but I always get 'Not checked yet' in the results column. One way to have something in this column (not for all keywords though) is to select google.com USA as search engine, but I'm afraid that those KEI results are not usable for France, are they ? Looking forward to reading soon from you and to continue this excellent ebook, thanks a lot for your excellent work ! Amazing! I love your brilliant KEI explanation. I've never heard of KEI before, but that's a great idea, and worthy of implementation! Thanks! Matt, you're right. Hope to get down to rewrite this chapter soon. BTW, the <a href="http://www.link-assistant.com/rank-tracker/">Rank Tracker</a> tool I suggest here is using Google AdWords as the default and recommended tool to check search volume. This is really good - just one comment. You suggest using Wordtracker to find search volumes, but Wordtracker is based on historical search volumes for search engines outside Google. 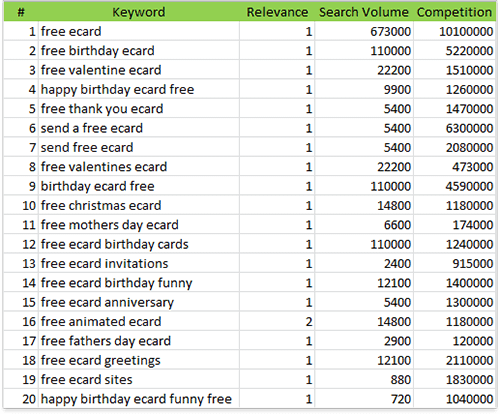 Isn't it better to find the search volume by using the Google Adwords Keyword tool instead? Especially since Google has something like 65% of the search volume market and the results are therefore (1) far more representative of the total search market and (2) produced using current figures rather than historical figures. I have Rank Tracker sorting through about 200 suggestions from google adwords as I type this. I have a question. I am a financial consultant. One thing I have been doing a majority of lately is educating consumers about the different options available for getting rid of debt. In my keyword research I find the most relevant phrase on that topic has a KEI of about 90. The next closest keyword is only a 5 in terms of KEI. The phrase is very relevant to my site. Does this mean if I narrow it down to a few key words, that this one with 90 KEI is the word I should focus most of my effort on optimizing? This phrase gets over 100K searches per month. what is considered a good KEI number? Google Adwords has already been added to Rank Tracker and now it's the most precise and informative tool to get search volume data, especially if you're optimizing for Google. Besides it works for many languages. But that is paid , right? You do no need to pay for using Google Adwords in Rank Tracker. You just add your Google account and use it. can i ask what the difference is between using wordtracker to find how many times a keyword has been searched for (per day and then muliplying it by 30) compared to using the google adwords tracker that shows you the global monthy search volume? Maybe you've incorporated this already, but is there a way to add a relevance column to input our perceived R value for each keyword in Rank Tracker? Adding a relevance multiplier seems like a great add-on. Although I've only played with the free versions so far, it will be difficult to pass on the paid version of Seo PowerSuite. Well done! Probably exporting it into Excel and adding the KEI relevance column with formula would work fine. Hello Dan! 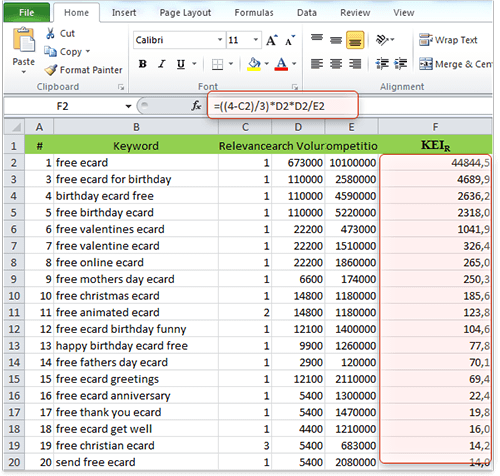 I dont understand why you prefer the "Keyword Efficiency Index with Relevance" and the Rank Tracker uses "just" the Keyword Efficiency Index formula. Did I miss something?